A wiki for the 1990s television series "Northern Exposure" that compiles information from all over the Net and other sources that anyone can edit. My page about Northern Exposure, one of my favourite TV shows of all time. 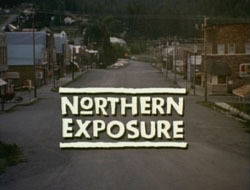 A collection of Northern Exposure links and pictures of tv's best show. Legends told by Marilyn Whirlwind and on-air meditations from Chris Stevens, searchable by topic or episode.